Breakfast is served daily from 7:30 AM until 8:15 AM. and consists of a choice of two cereals, oatmeal, fruit, milk, juice, and one of the following (offered at different times): toast, french toast, cheese omelets, scrambled eggs, boiled eggs, yogurt, muffins, pancakes, breakfast burrito, or ham & cheese sandwich. With the very reasonable price of $1.30 for full price or $.30 for reduced, it’s hard to feed your child at home for less! Lunch is served at 10:55 AM to 11:40 AM. Grades 4K & KG eat from 10:55 AM to 11:20 AM, 1st & 2nd from 11:00 AM to 11:20 AM, 3rd through 6th grades eat from 12:10 PM to 12:30 PM. Junior High student eat lunch from 12:20 PM to 12:50 PM. 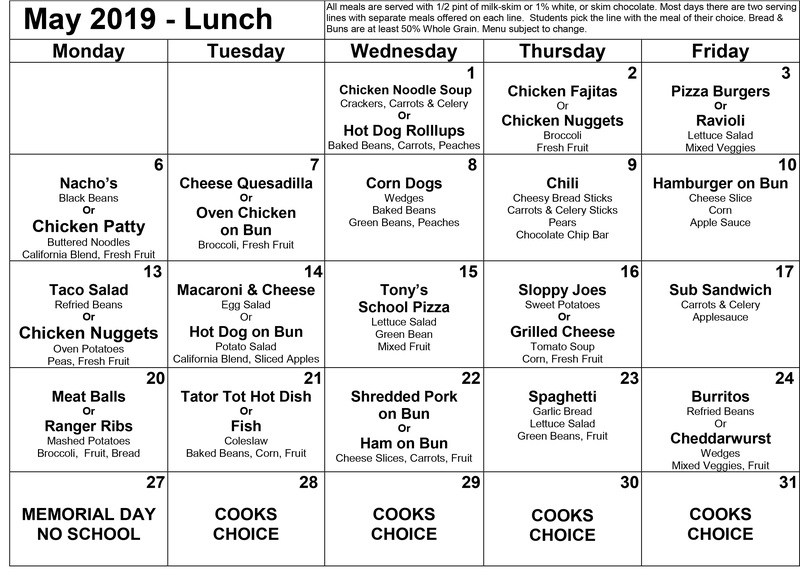 High School student lunch schedule is as follows: Monday: 11:21 AM -11:51 AM, Tuesday 11:38 AM - 12:08 PM and Wednesday through Friday 11:25 AM - 11:55 AM. Students have their choice of two meals daily on two separate serving lines. Students pick the line with the meal of their choice. All meals are made from scratch with the exception of pizza and some patties. Homemade bread or buns are served with most meals, with butter and peanut butter available. (Bread not available with every meal). Fresh or canned fruit and vegetables are served every day with one baked dessert a week. All meals are served with ½ pint of milk,(skim white, 1% white, or skim chocolate). 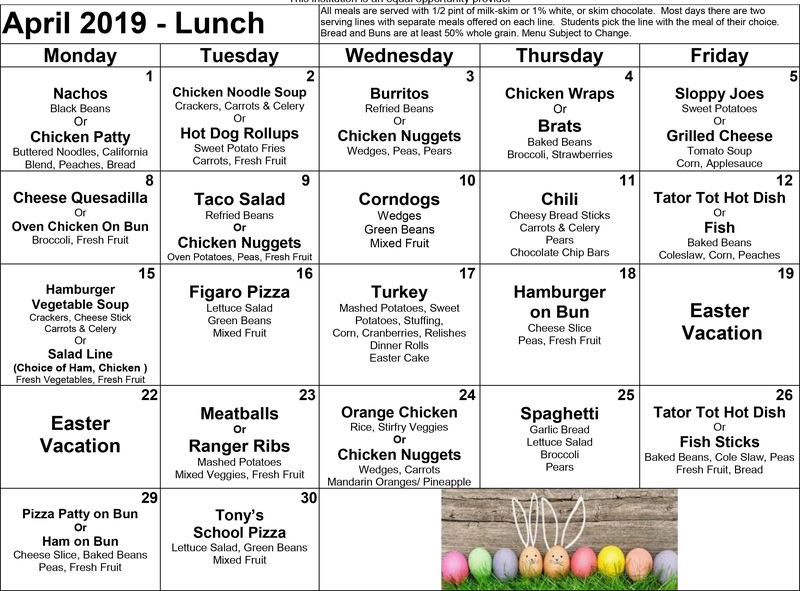 Visit your cafeteria! It’s fun to have breakfast or lunch with your children. You’re always welcome to join us. Be sure to check with the District office to find out about security procedures and to purchase a meal ticket. Julie Behnke, Food Service Director, can be reached at 715-856-5151 ext. 314. E-mail behnkej@wausaukee.k12.wi.us. Nutrition and physical activity are known to influence a child's development, potential for learning, overall sense of well-being, and risk of illness through adulthood. Students who practice good nutrition and engage in daily physical activity attend school with bodies and minds ready to take advantage of the learning environment. The School District of Wausaukee therefore, encourages all members of the community to help create and support a school environment that emphasizes healthy, lifelong habits of good nutrition and physical activity. The District Wellness Committee, under the guidance of the District Administrator, is responsible for the development, implementation, communication, and ongoing evaluation of the Wellness Policy. It’s members will work as a team to develop annual goals specific to the individual wellness aspects as outlined in the USDA federal mandate. Provide a comprehensive physical education curriculum that is available to all K-12 students and that teaches the importance of physical exercise and exposes students to a wide range of physical activities. physical exercise. This goal will be pursued through action steps in annual planning. efforts to publicize and encourage student participation. opportunities for facilities use by placing them on our website. See annual Wellness goals for specific activities in a given year. Provide age-appropriate instruction in nutrition and health education that gives students knowledge of the human body and the means to maintain lifelong health, including good nutrition, disease prevention, and healthy lifestyles. Limit the availability of food and beverages with minimal nutritional value to students on school premises before the start of the school day, during the school day, and within 30 minutes after the school day. beverages shall not occur in the food service area during the meal periods. in connection with school or classroom celebrations). and community members through school publications, school activities, and school websites. that are in direct competition with the National School Lunch and School Breakfast Programs. See annual Wellness goals for specific employee health and wellness activities in a given year. Involve school administrators, teachers (including physical education and health education teachers), school food service staff, school health professionals (i.e., the registered nurse(s) serving the schools), students, parents and guardians, school board members, and other interested members of the school community in the development, implementation, and periodic review and updating of the District’s school wellness policy, nutrition guidelines, and related wellness plans. This shall be done through School Wellness Committee. Inform students, staff, parents and guardians, and the public of the District’s school wellness policy and nutrition guidelines via the District website and via at least one annual inclusion of appropriate reference information (that identifies where/how an interested person can obtain the District policy, reports, and other wellness–related information) within school/District handbooks, newsletters, or another similar method of providing active notice. Prepare an annual school wellness progress report that describes each school’s progress toward meeting the District’s wellness policy goals over the previous school year and that includes all other content required by applicable federal regulations. At least once every three years, conduct a comprehensive assessment of the District’s wellness policy and its implementation in each school. The assessment and the resulting report will include all content required by the applicable federal regulations. Make each annual school wellness report and each triennial assessment available to the public through posting the reports on the District website in a reasonably prominent manner. Keep the Board informed of the District’s and individual schools’ progress toward the school wellness policy goals and of any recommendations for policy changes and improvements, such as any recommended changes that are based on the results of an annual report or triennial assessment. Building principals are responsible for ensuring school compliance with the District’s school wellness policy, nutrition guidelines and related wellness plans and for submitting required progress reports on school compliance to the Business Manager and District Administrator. Updates regarding all wellness goals and policies are available on the district’s website and are printed in the school’s newsletter. Please review the meal application carefully available in the district, JH/HS and elementary offices. Much of our school funding is based on the number of students qualifying. Students on free and reduced charges really help out the School District of Wausaukee because of our reimbursement and funding rates from the state.